I had a wonderful not-dream last night, in which I could clearly see that I stood between two rivers… one was the river of mundane “stuff”, of handling things that needed handling, of taking things in stride, of getting upset about whatever, of meeting each day and going to bed at night. The other was a river of ecstasy. I could stand with both feet in either river, or I could stand with a foot in each. My choices produced my experience of what it’s like to be here on Earth in a body. If I had both feet in the mundane river, I didn’t know how to get to the ecstasy river. If I had both feet in the ecstasy river, caring about any happenings in the mundane river was just way too much effort. The living dream really worked and felt best, of course, when I had one foot in each. 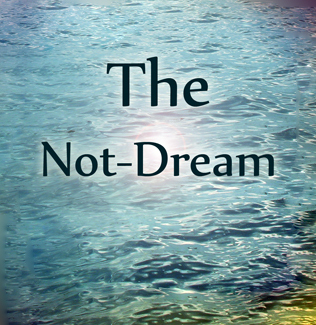 There was no judgment in the not-dream. It simply was. The thing that was so wonderful about it, was how clear it was that we didn’t need to do anything to go from one river to another… we could just be there and we were already there. And neither river was actually “better” than the other. It was just how we wanted to do life in that moment. So I went into ecstasy and stayed there til my partner, David, got us up in the morning. Later on, as I sat outside in our country yard in the warm barely-there breeze, I went there again… into the ecstasy. I could see I had so often been over-shooting my goal by trying too hard. It reminds me of looking at stereograms, but in reverse. Stereograms are designs that have 3D pictures hidden in them, which you can only see if you focus through the design instead of looking at the paper. Here, I find myself focusing somewhere outside myself, blinded to seeing that I am already that which I seek. The seeking only gets me further away. Once more I was being shown the truth that enlightenment isn’t someplace you have to get, because you’re already there. If you would like to find out more about my background which made my spiritual work possible, go to my Biography page, to the page about my recording, and to my article, "The Transformation." Cari Alter is a gifted Tranformational Life Coach, a Spiritual Guide and Healer, a Sound Healer, certified practitioner of Hands-on Healing, Reconnective Healing and Master M.A. Breatherapy, as well as a Reiki Master, with a private practice and transformative meditation classes and workshops in Marin County, California. Long distance phone or Skype sessions are also available and are equally effective.